The study includes images and shows photographs of the damage. There were also signs of inflammation around the areas of damage in the form of white blood cell infiltration. The mucosal glands were disturbed and blood vessels were congested. There was also an increased level of shedding of mucosal cells, higher rates of division of cells lining the mucosal glands and larger numbers of mucous secreting goblet cells. 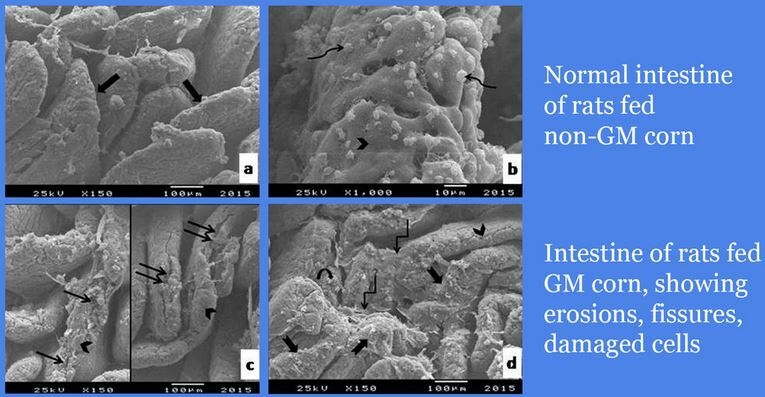 Results from the current study could show that in spite of the assuring reports on GM products, GM corn has profoundly altered the histological structure of the jejunal mucosa at many levels and revealed several alarming signs, as the proliferative and eroded hemorrhagic lesions in addition to several ultrastructural alterations described here for the first time for jejunum under GM corn influence. The researchers also called for more research to be done in order to determine exactly how this strain of GM corn inflicted this type of damage on the intestinal system. Their suppositions include direct damage as a result of the Bt toxin or indirect damage as a result of gut bacteria disruption. The limitations of the study include the fact that the control group was not given the Ajeeb non-GM variety and there was no analysis in terms of the possibility of the presence of pesticide residues and other contaminants. Still, the findings of this new study are extremely significant in that they demonstrate that at best, GM MON810: Ajeeb YG causes damage to the intestinal system. However, the results do seem to indicate that it is the process of genetic modification that is the cause of this damage. This is not the only study of its kind. It should be noted, that in both of these studies the non-GM Ajeeb variety was used for the control group, thus demonstrating that the process of genetic modification is most likely the culprit for such damage. Likewise it should be noted that the rats showed now outward signs of illness (possibly due to the short duration of the study) but they were clearly sick. Perhaps now we can begin putting to rest the disingenuous claims by GMO proponents that there are no studies showing the dangers of GMOs. As more and more studies are published demonstrating the danger of GMOs – corporations, governmental regulatory bodies and scientific call girls as well as the fake news media outlets that constantly tout the benefits of GMOs will continue to lose their credibility. This entry was posted on January 3, 2017 by conspiracyanalyst in GMO Foods, Health & Wellness, US News and tagged GMO Foods.